HP Tri-Color #17 IJ Print Cartridge 430 Yield(C6625AN) : Disk-O-Tape, Inc.
Get photo-quality color results when you use the HPC6625AN tri-color cartridge. 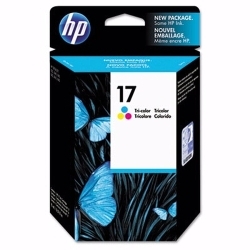 Use genuine HP inkjet print cartridges for professional-quality printing every time. Warranty, standard HP’s inkjet print cartridges, ink cartridges and printheads are warranted to be free from defects in materials and workmanship during the period of the warranty.